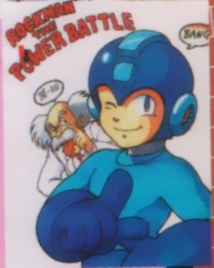 Your free pic this week is an original piece from the Capcom design team done for their first Rockman arcade title, Rockman The Power Battle. This was the largest version of the image I could find. It appeared in CAP! Vol 12. The red rectangle on the left is from overlaid text. Not sure about the artist. An obscure but fun one!